I'm currently rewatching the revamped Battlestar Galactica for the first time in many years. I'm thinking about doing a detailed recap/rewatch for the series later on, if time allows. It's a show whose virtues have certainly become greater over the years but whose flaws have also more notable. Certainly it's a show that's still worth watching, if only to join in on the never-ending debate about the controversial ending. The show's production order is probably the best viewing order as well, since this is the order the series originally aired in and is what most people viewed the series in. This also best protects later spoilers and crucial plot revelations. When BSG was rebooted in 2003, it first returned as a pilot mini-series consisting of two 90-minute episodes. This was initially released by itself on DVD. Later on, it was incorporated into the US Season 1 DVD box set but not in the UK Season 1 DVD box set. For UK DVD watchers, the mini-series still has to be purchased separately. The mini-series is included in the Complete Series Blu-Ray set. Between Seasons 2 and 3, NBC requested that the BSG team produce ten short "webisodes" to advertise the return of the show. The producers agreed and filmed ten short segments which, when combined, form a 24-minute "prelude" to the third season. However, a legal dispute over pay for the webisodes (which also affected studio-mate series The Office) caused delays in production. As a result, The Resistance was issued only in standard definition (even on the Blu-Ray release) and with a minimum of post-production. However, they do set up the state of play at the start of the third season. They can be found on the American Season 3 DVD release, but not on the UK DVD release. They are included in the Complete Series Blu-Ray set in all territories, however (under the special features for Disc 2 of Season 3). Produced as a straight-to-DVD special between the third and fourth seasons, Razor was a 90-minute TV movie set towards the end of the second season and expanded on the backstory of the battlestar Pegasus. A series of webisodes set during the First Cylon War preceded Razor, but these have been integrated into the episode itself on the home media releases. 407: Guess What's Coming to Dinner? 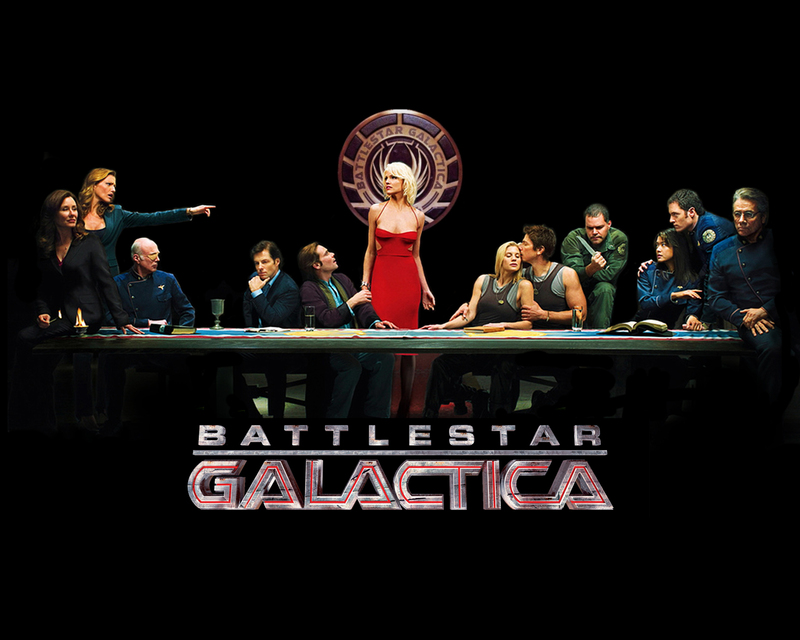 The fourth season of Battlestar Galactica was announced as being the last. However, SyFy delayed transmission of the season by several months due to problems caused by the 2007-08 Writer's Guild of America Strike. They then split the final season in half, airing the two halves a year apart. Although this gave more time for post-production, it caused great irritation in the fanbase. These webisodes were produced between the two halves of Season 4. However, due to some slight confusion, they are set between Sometimes a Great Notion and A Disquiet Follows My Soul rather that directly between the two halves of the season. This is because Season 4, Part 2 was originally supposed to end with Sometimes rather than Revelations, but it was decided that Revelations made for a more shocking cliffhanger. Fortunately, the webisodes do not contain any major spoilers for Sometimes. They are not included on either the US or UK DVD sets, but can be found on the Complete Series Blu-Ray set. Season 4 was never released as one whole. Instead, the first half was listed as "Season 4" and the second half as "The Final Season" on DVD releases. The Plan was produced as an attempt to address fan concerns that the Cylons had never actually had "a plan" (as described in the opening to every episode of the first three seasons), and effectively presented everything that happened in the first two seasons from the Cylon POV. However, fan response to the TV movie was muted, especially coming after the conclusion of the series as a whole. The Plan is not part of the Complete Series Blu-Ray set and has to be purchased separately. 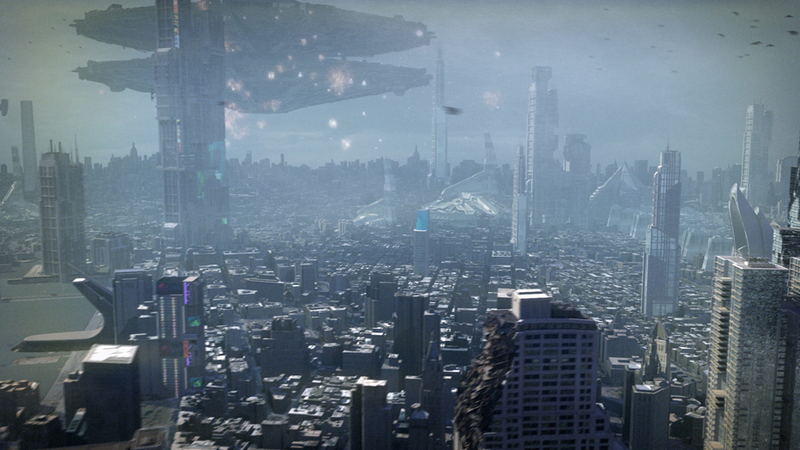 Caprica is a prequel series to BSG, taking place fifty-eight years years prior to the mini-series. It depicts the creation of the Cylons and the sequence of events that led to the First Cylon War. Although cancelled prematurely, an extended coda in the final episode does indicate how the story would have resolved and the war would have started. Caprica is readily available on DVD, but has not been released properly on Blu-Ray in the UK or USA. Oddly, complete series box sets on Blu-Ray are available from France, Germany and Sweden. Blood and Chrome was a proposed second prequel series, taking place sixteen years after the events of Caprica and forty-two before the events of the mini-series. The planned series would have covered the final two years of the First Cylon War. However, the series was never made leaving the pilot as a stand-alone TV movie. Watching BSG in chronological order will likely be fairly confusing. BSG is reliant on backstory revelations delivered at key points in the narrative and watching later series and TV movies can result in significant spoilers. Therefore, this is only really recommended as a rewatch experiment. This is the (rough) show timeline, sans spoilers. 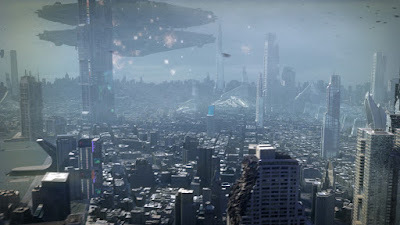 c. 4000 BF (Before the Fall): The Thirteenth Tribe leaves Kobol to colonise Earth. The semi-canon comic book BSG: The Final Five begins. c. 3600 BF: The Book of Pythia is written. 2000 BF (1,942 years before the events of Caprica): The remaining Twelve Tribes depart Kobol to colonise the Twelve Colonies. 58 BF: Caprica takes place. The epilogue to Season 1 takes place several years later. 52 BF: The First Cylon War begins. 51 BF: The semi-canon video game Battlestar Galactica: Deadlock takes place. 42 BF: Blood & Chrome takes place. 40 BF: The First Cylon War ends. The flashbacks in BSG: Razor take place. 30-20 BF: The flashbacks in BSG: Occupation (episode 201) take place. The semi-canon comic book BSG: The Final Five ends. c. 6 BF: The flashbacks in BSG: Hero (episode 308) take place. Dialogue in this episode suggest it is more like 1-2 BF, but this was a continuity error. 0: The Fall of the Twelve Colonies. BSG: The Plan begins. BSG: The Mini-Series takes place. 0-1 AF (After the Fall): BSG: Seasons 1-2 and the remainder of The Plan and Razor take place. 2-4 AF: BSG: Seasons 3-4 take place. BSG: Razor takes place between Season 2, Episodes 17 and 18. BSG: The Plan takes place betwen the mini-series and Season 2, Episode 20. One further thing to consider (alluded to above) is Battlestar Galactica: The Final Five. This is a four-issue comic book written by show scriptwriter Seamus Kevin Fahey. Most of the BSG comics are non-canon, but The Final Five is interesting because it was directly based on the ideas and concepts developed by Ronald D. Moore and the rest of the production team whilst they were planning the final few episodes of the series (particularly the backstory-heavy episode No Exit). This comic book begins over 4,000 years before the rest of the series and tells the story of Kobol, the Thirteenth Tribe, the colonisation of Earth, what happened there and the later activities of the Final Five. Although I would hesitate to take the comic book as canonical, it certainly gives us our best look at what was going on in the deep backstory of the series, as the writers and producers were conceiving it. In 2017 the video game Battlestar Galactica: Deadlock was released. This was an approved product worked on by some of the team at SyFy who worked on the show, although Ronald D. Moore was not involved. The video game tells the story of the first year or so of the First Cylon War. Tried to rewatch recently. Knowing how things are going to end up just really soured it for me and I quit. I hated the ending so passionately that it ruined the whole series for me, despite great effects, stories and acting. 33 always stood out as a particularly great one for me that told me early on that this is not your ordinary SF show. It's real. It's gritty and shows people all up and down the hierarchy as they try to establish themselves after the Cylon attacks. Skip Season 2's episode "Black Market" entirely and skip all scenes aboard the Galactica in season 3's "Hero". These are the worst episodes of the whole series. Urgh. "Black Market" isn't a good episode but I think it gets a ludicrously disproportionate amount of hate. Possibly because it is the first "bad" episode of the series after a run of quality episodes that may outstrip any other SFF series in history (28 by that point). "Hero", "The Woman King", "Unfinished Business", "Dirty Hands", "Sine Qua Non" and "Deadlock" ("Deadlock" gets my vote for worst episode of the entire series by a country mile). I don't enjoy the show, I've seen a few episodes due to friends being fans. I found it frustrating to watch with few enjoyable characters for me. Some of the technical details are interesting but if that's the highlight of a show, it's failed as a story. Whenever it gets quiet on your blog and I used to wonder what's going on, you know to surprised us with a major post and/or various quality entries. I wanted to say a big "thank you" for all your precious work. You have become my #1 go-to blog for spec fic news. Specifically, I want to express my gratitude to this post. I haven't watched the new BSG series yet but realize (once again!) that I should do so soon! This entry is a very helpful guideline for folks like me. Again, thanks! and keep up with the good work! Ending is one of those things you either love (or at least like) or hate. I'm in the first camp and have always wondered at the uberhatred those last episodes elicit. I agree with Adam that Black Market hate is also over the top. Maybe people latch onto it because Ron Moore himself famously crucified the episode in his podcast? Quite a few episodes are worse than that one. Deadlock! Abysmal episode. What makes it even worse is that it's a "mythology/arc" episode that can't be easily skipped. Oh, and I dug out an older article I wrote about the subject. One question if I may (apologies for any necro feelings): when would be the best time to read The Final Five comics, for someone who has yet to watch any BSG (i.e. me)? Cheers, and thanks for a very in-depth list! The Final Five comic is best read after the entire rest of the series, I think. I watched the series before, except razor, the plan and the webisodes. I forgot who were the cylons. I was trying to watch this by the suggested viewing order of this blog but after watching season 2. I watched razor and now the plan. I was surprised to learn that the wife of XO Saul tigh is a cylon. It was never revealed in any previous episode. So was this a mistake in the viewing order or it was meant to be revealed in the plan? Because the revelation was so casual, i'm thinking there is an error in the order. Chronologically, watching "The Plan" when you did is correct. However, watching chronologically is not actually the suggested viewing order on this blog. As the author says, watching chronologically can spoil later reveals, and that's one of those. This is one show where the best viewing order is the actual production order. Damn, I didn't see the end! I guess I can do it.